Rotor heads of the world unite. In May, 1942, then-LCDR Erickson was transferred to Coast Guard Air Station Brooklyn, New York, at Floyd Bennett Field. After reporting there, he was ordered to the Sikorsky Aircraft plant at Bridgeport, Connecticut, for training in the construction and operation of helicopters and to establish liaison with the manufacturer. On this detail he headed a group of two other officers and five aviation machinist mates who formed the first Coast Guard Helicopter Detachment. From the Sikorsky plant Erickson sent memos to his superiors evaluating the operations of the helicopter and sparking a number of ideas for practical uses of it--many of which he later proved in tests and which ad far reaching effects. 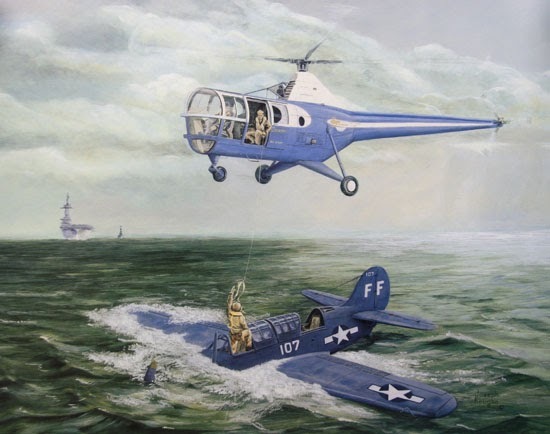 He recommended the helicopter as ideal for lifesaving, for law enforcement patrols, and among others of his ideas as "eyes and ears" of convoy escorts in spotting submarines. He insisted that helicopters could be carried on board ships that could provide a suitable landing platform. Completing his training at Sikorsky, Erickson was designated as the first Coast Guard helicopter pilot (Coast Guard Helicopter Pilot No. 1) as well as instructor in September, 1943. He then returned to Air Station Brooklyn, which became a helicopter training base, to serve as its executive officer until May, 1944, and then as its commanding officer for a year. During that tour he organized a detachment and trained pilots who participated in the joint U.S.-British evaluation trials held on board the SS Daghestan in November, 1943, off Bridgeport to ascertain the limiting conditions for carrying out helicopter flights from a ship underway at sea. He also trained 102 helicopter pilots and 225 mechanics, including personnel from the U.S. Army Air Force and Navy, the British Army, Royal Air Force and Navy, as well as the U.S. Coast Guard. He was promoted to Commander on 1 December 1943. He received an official commendation for his actions the following month when he piloted a Sikorsky HNS-1 that carried two cases of blood plasma lashed to the helicopter's floats from New York City to Sandy Hook, New Jersey, for the treatment of Navy crewmen of the Navy destroyer USS Turner, which had exploded and burned off New York harbor on 3 January 1944. Having performed that heroic deed in violent winds and snow that grounded all other aircraft Erickson became the first pilot in the world to fly a helicopter under such conditions. It was also the first "lifesaving flight" ever performed by a helicopter.